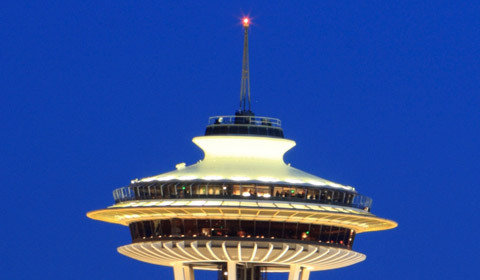 Built in 1962, for the World's Fair, the Space Needle is a Seattle icon on par with the Eiffel Tower in Paris and the Statue of Liberty in New York. Visitors can ride the elevator over 500 feet into the sky to the Observation Deck. If you dine at SkyCity Restaurant - located just below at 500 feet - admission to the Deck is included. It's best to book your SkyCity reservation in advance, and you can do so up to 90 days ahead of time. Seattle Space Needle Tickets can be purchased at the bottom of the tower or on the website. Try their new timed tickets and avoid the often long general admission lines. General admission ticket prices for the Obersvation Deck start at $12. Monday-Thursday, 10am-9:30pm; Friday-Saturday, 9:30am-10:30pm; Sunday, 9:30am-9:30pm. How high is the Observation Deck? It is 520 feet high and offers panoramic views of the downtown Seattle skyline, the Olympic Mountain Range and Douglas fir forests. Mount Rainier, the tallest mountain in Washington, is visible over 50 miles away. You can also see the waters of Elliott Bay. Make your way around the entire circular observation deck and take a peek through the telescopes stationed throughout. What kind of food is served at SkyCity Restaurant? SkyCity serves dinner every evening, weekend brunch, and lunch Monday through Friday. Chef Jeff Maxfield is passionate about local seafood and produce, and that's reflected in his menus. For brunch, you might find huckleberry pancakes or razor clam and corn chowder. For lunch try the mouthwatering salmon fritters or dungeness crab mac-n-cheese. There's aslo a great kids' menu and awesome wine list.